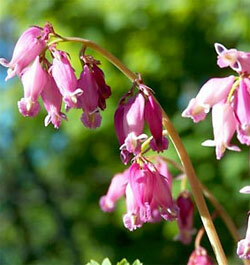 Botanical Name: Dicentra formosa Description: Bleeding Heart has been a garden favorite for centuries. This is an improved variety. Unlike your grandmother’s Bleeding Heart, which bloomed just once late spring, Luxuriant continues to bloom through the summer. It is also not as tender as the traditional Bleeding Heart. Its fern-like foliage is attractive on its own, and the heart-shaped pink flowers hanging from gracefully arching stems are delightful. It grows 12 to 18” tall. Give it a shady spot in the garden and it will give your garden a touch of old-fashioned charm. We ship #1 grade root divisions that will grow quickly into full, beautiful plants.